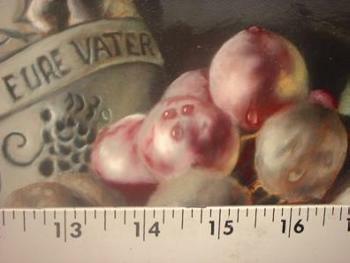 The Color Layer in indirect and flemish oil painting techniques. The color layer, where your painterly expressions come alive! Home > Flemish Technique explained > Color Layer explained. 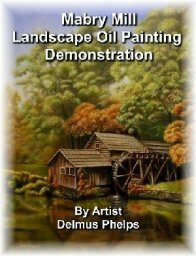 This lesson discusses the color layer used in the Flemish Technique and other indirect methods of oil painting. Now, understand, this is not my trade marked method of painting. It's been around a very long time, and it has been the easiest for me to use. The method was introduced and perfected in the renaissance era. 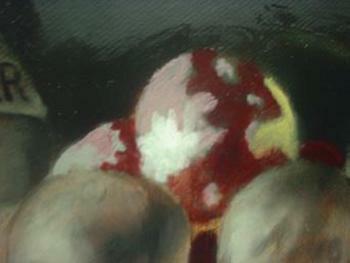 You'll be amazed at how little color paint in this layer you have to apply to achieve a magnificent painting. Why? If you lived when this method was developed, you would be finding bugs, rocks, plants, and drying them. Then you would be crushing them and adding linseed oil until you made what you can get in a tube today! Well, not exactly. Their pigments were sometimes very dangerous but they were brilliant! Modern manufacturing comes close, but I can only imagine that their paints simply performed better than today's modern equivalents. I won't get into great detail about the mixing of your colors here. I have a complete section dedicated to this. Just click the link to get there. Here we will concentrate on strictly the applying the color layer. But I do have a few tips will help get the ball rolling. Use as few paints as possible to achieve the color you need. Mix small amounts at first, (you'll have to scrap some, but don't throw it out.) (You can add it to your gray mixtures in small amounts). Once mixed, pull a little on knife and squint your eyes while viewing the knife just in front of your subject. If the knife disappears, you've matched your color. Don't be overly concerned here. If your red or green is not perfectly matched to the subject, who's gonna know! The human brain only has about a 6 minute recall when it comes to exact color! Now, that doesn't mean paint a alizarin crimson apple! Keep your colors true to nature as close as you can, but don't spend 20 minutes trying to find an exact match. Here I start a set of grapes. And after some correcting of the paints applied. 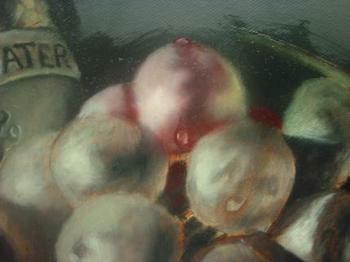 Below is a few more grapes with a few details added. You usually save small details and texture for the final layers, but I couldn't resist adding a few dew drops at this point. I talk about creation of dew drops in great detail in my e-book. Speaking of dew drops! These beauties are one of the best ways to separate your work from most others. If you're happy with your results, sit back relax, and allow your painting to dry. You can start on another while you wait thereby having several in the "pipeline". When you're ready to go on to the next step, click here for the Finishing Layer. To go back to the start click here Flemish Technique Explained. Or to the top of lesson here on the color layer. Maybe you need even more details and photo examples of this part of the process. You can download the complete book. It has about 250 photo's of step by step instruction similar to what you see here, but just more. I also use much better graphics (high def photo's) to point out specifically things that can help you develop your painting. 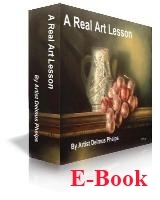 Get more information on this top selling instructional E-book.